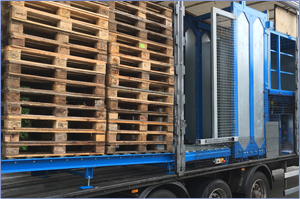 NEW: Mobile sorting-platform on Semi-trailer with liftable roof. 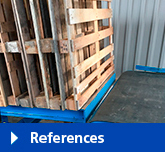 Useful for pallets of 80x120cm and 100x120cm. Does not need much space. Here is the presentation showed at our stand during the succesfull LIGNA 2017 show in Hannover. Your broken pallets repaired thanks to Cekamon Saws!! or (if there is no other option) need to be dismantled. 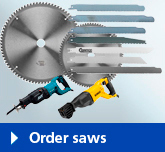 Cekamon Saws has cheap and fast solutions for all types of pallets and all palletcompany's! 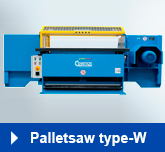 CekamonSaws has over 40 years experience in the palletindustry and machine construction. This experience allows us to give a custom and peronsal advice for all of our clients. Besides the many services CekamonSaws has to offer, another big advantage is that Cekamon has been a leading company in the palletindustry and the logistic sector. Do you want to keep track of the developments and productnews? Register here for our newsletter! You can save thousands of euros per year on your pallet wood and purchase costs. For a personalized offer please fill out the contact form.